LONDON (AP) — Sometimes no practice makes perfect — for Roger Federer anyway. It will be a repeat of a dramatic Wimbledon quarterfinal earlier this season, in which Anderson came from match point down in the third set to win in five on his route to the final. Anderson thrashed Nishikori 6-0, 6-1 earlier Tuesday to move to 2-0, with the lopsided scoreline all but assuring the South African debutant’s place in the last four. Thiem is facing an opening-round exit at the O2 Arena for a third straight season and will need to defeat Nishikori in straight sets to have any chance of progressing. As had been the case in both players’ opening-match losses on Sunday, unforced errors flowed early on. While Federer was able to compensate with his serve, Thiem was left exposed. The Austrian’s forehand gifted Federer a break for a 2-1 lead and then his volley came up short to help the Swiss star extend that advantage to 5-2. Federer, who is chasing a 100th ATP Tour title, started to play more relaxed and seemed content with simply keeping the ball in play and waiting for mistakes. It worked, as another forehand mistake from Thiem put Federer in complete control in the second set. A Federer backhand up the line set up match point and Thiem’s 34th unforced error — another volley into the net — ended the day’s second one-sided contest. 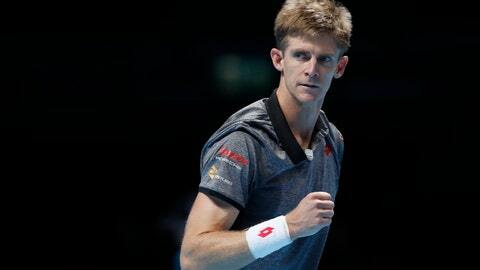 The 32-year-old Anderson, who lost just eight points on serve, was on the verge of completing just the second whitewash in the competition’s history until Nishikori won the penultimate game.